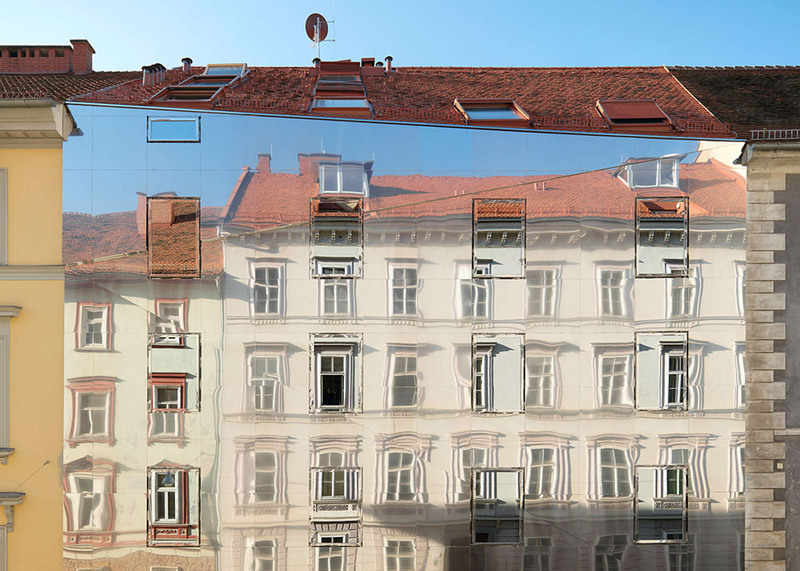 A+Awards: next up in our collaboration with Architizer's A+Awards is an apartment building in Austria that is covered in mirrors to reflect the facades of surrounding historic buildings. 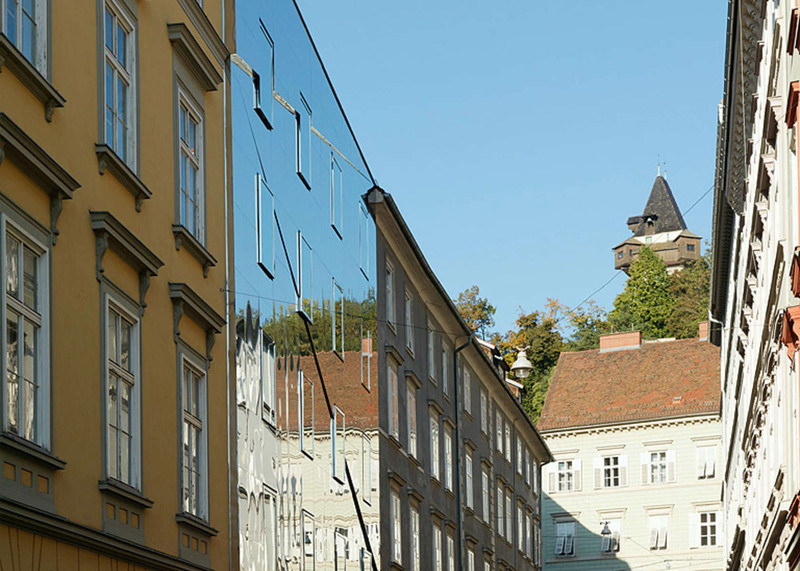 Graz architecture studio Hope of Glory was commissioned to create a residential building on a historic street in the UNESCO world-heritage-listed city. The site was the only empty plot in a row of 19th century houses and apartments from the Wilhelm era. 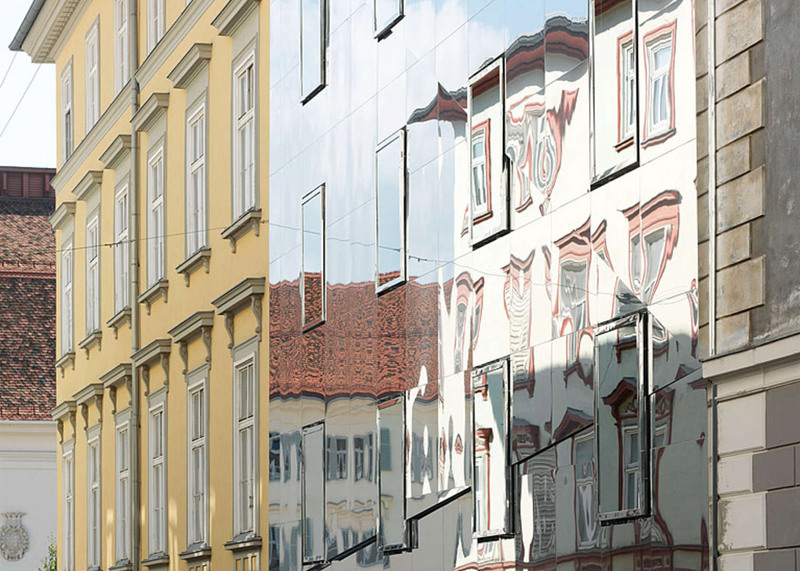 The architects, also known as HoG architektur, had to create a front facade that echoed elements of the historic buildings to comply with strict heritage protection rules, but covered it in a mirrored surface to update and distort the design. "The street elevation interprets the design principles of the mid-19th-century using a contemporary language," said the studio. 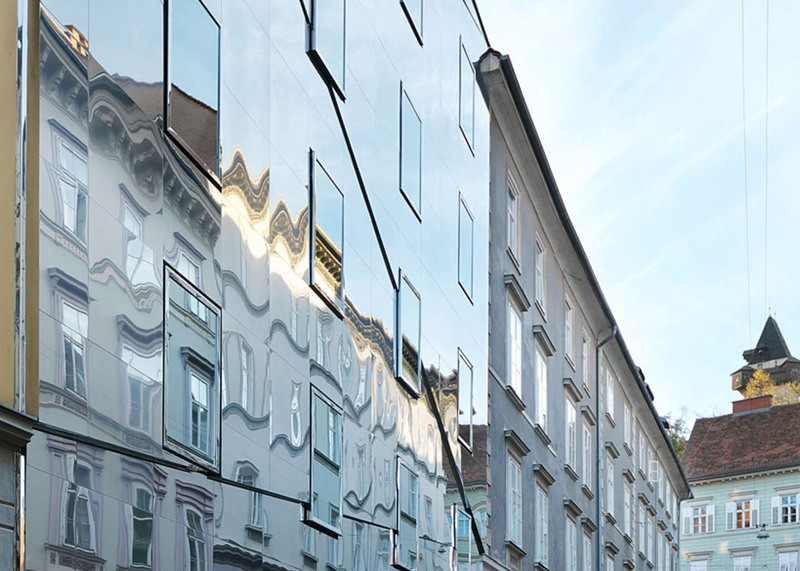 "Via reflection, the facade depicts the facades opposite, which appear refracted as in a kaleidoscope due to the slightly different inclination," added the architects. "In this way the new building has the paradoxical effect of having both a strong presence and of not being there." The building has a different number of floors than its neighbours, so the mirrored surface is applied in slightly inclined triangular horizontal sections to break up the facade. Slightly protruding or recessed windows are also arranged independently of the floor level, to further disguise the building's internal layout. A slope at the top of the facade connects the cornicing of the neighbouring buildings. 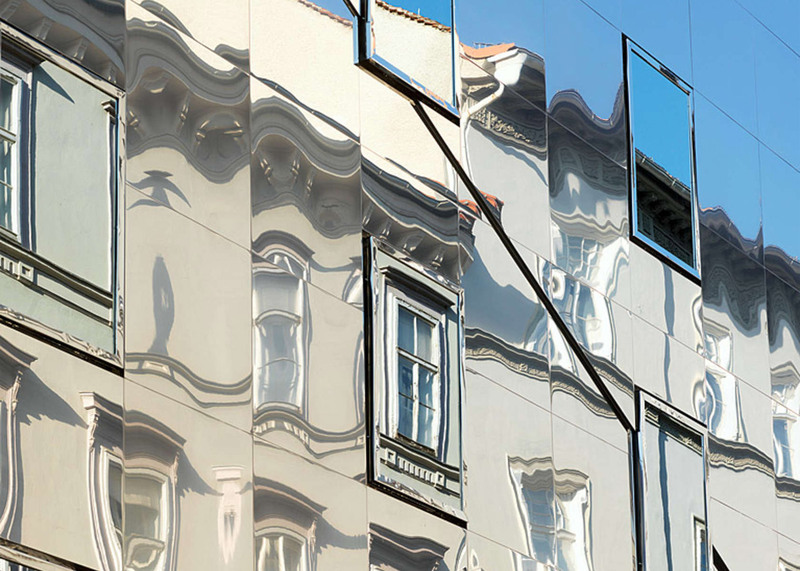 "The characteristic plasticity, created by a game of light and shadow on the cornices, protruding windows and surrounding frames, as well as their arrangement, is achieved by the absorption and continuation of these elements in the mirror-effect facade," said the architects. "In this way a three-dimensional appearance in the form of slightly inclined triangular surfaces emerges, which will link the different cornice heights of the surrounding buildings," they added. 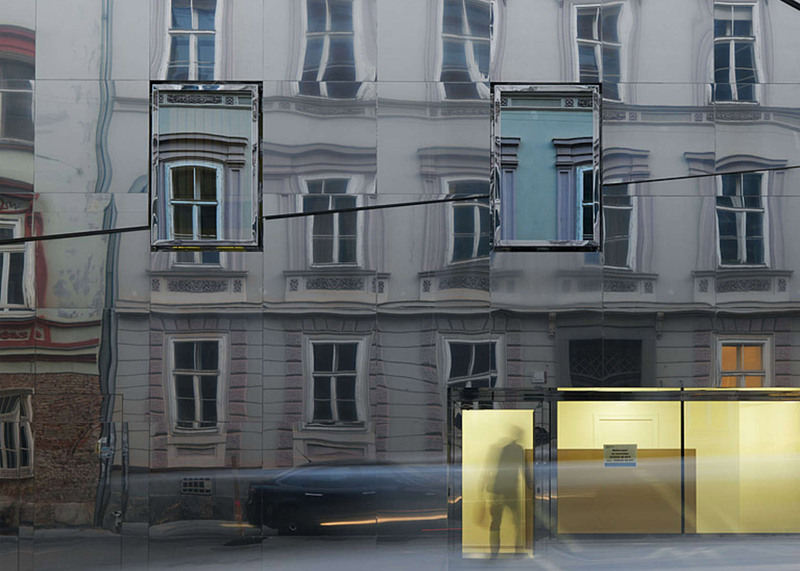 The building is named Stadthaus Ballhausgasse / Broken Mirror House, after the street it is located on and the effect created by the mirrored sections. The mirrored surface is made from a polished stainless steel, while the roof is covered with more traditional teraccotta-coloured tiles and is punctured by roof lights. "Stainless steel is one of the highest quality materials of our times and has a subtle life of its own as it is not as perfectly smooth and hard as glass," said the architects. In total, the building houses 17 apartments over eight floors creating a total floor area of 2,307 square metres. The basement level contains storage for residents. Behind the mirrored frontage, the building stretches back to make the most of the different levels of the plot. A smaller structure at the rear of the main building partially wraps around a courtyard, which provides outdoor spaces for residents. 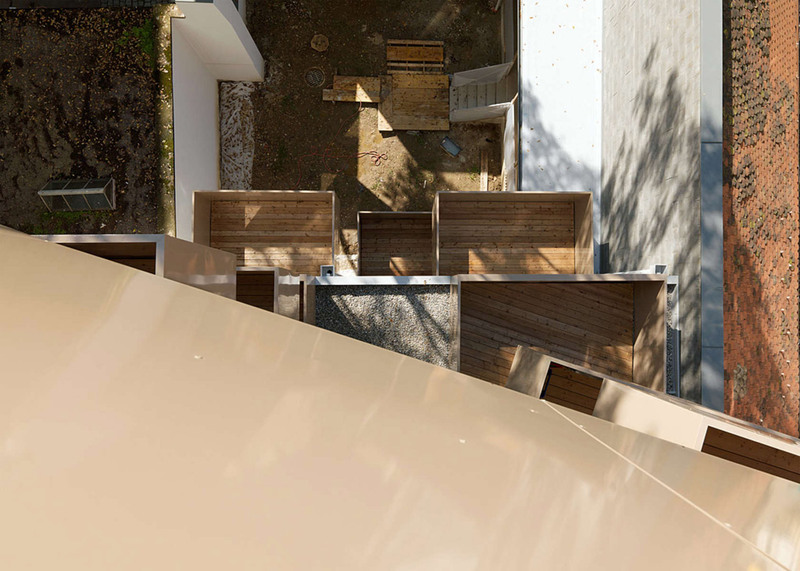 Box-like protruding balconies offer further private outdoor spaces on the upper levels of the main building, with wooden floors that contrast with the shiny surfaces used elsewhere. Hope of Glory was founded in 2006 by Martin Emmerer, Clemens Luser and Hansjörg Luser. Completed in 2013, its Stadthaus Ballhausgasse was named as one of the winners in the Residential – Multi Unit Housing – Mid Rise (5-15 Floors) category at the A+Awards 2016.